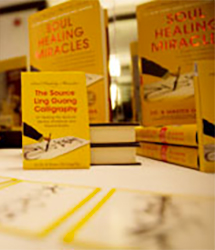 The Soul Healing Miracles teachings of Dr. and Master Zhi Gang Sha are available in a wide variety of offerings, include many books and audiobooks, CDs, DVDs, sacred objects, and more. Discover sacred soul wisdom, knowledge, and practical techniques to heal, rejuvenate, transform and enlighten you, your loved ones, your community, and Mother Earth. All products purchased through the online store receive a special blessing from Master Sha.